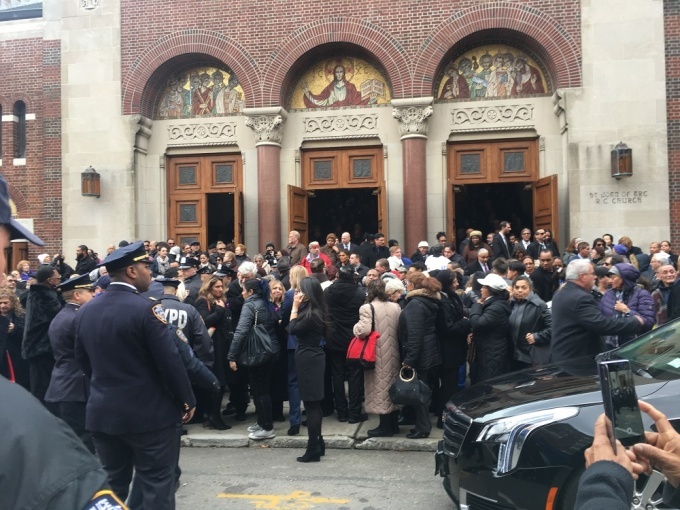 Elected leaders, family and friends packed out St. Joan of Arc Church in Jackson Heights this morning to bid State Senator Jose Peralta a tearful goodbye. 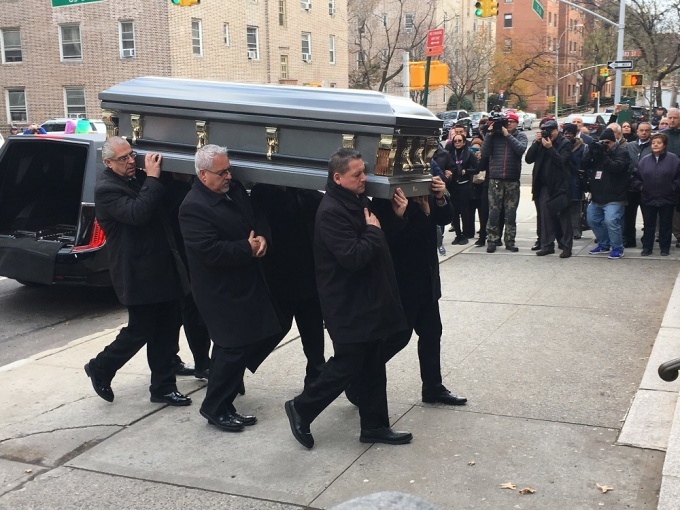 Peralta’s tight-knit family, including his wife, Evelyn Peralta, and their two sons, Matthew, 21, and Myles, 13, were also at the church, solemnly making their entrance following the six pallbearers that lead the procession. Evelyn spoke to the bond she and her late husband shared before his unexpected death last week during her eulogy. She told attendees that the late-state senator was extremely passionate about the DREAM Act, a piece of legislation he sponsored in Albany that would provide undocumented immigrants with the ability to receive financial aid for college if it were to become law. “I truly hope that the New York State Assembly and Senate will finally pass the DREAM Act and perhaps give my husband some credit for being the main sponsor and his tireless efforts,” Evelyn said. 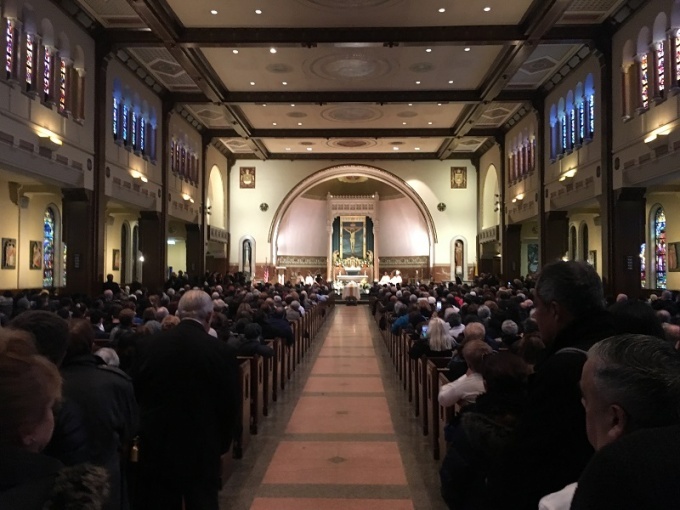 Father Brian Jordan, who presided over the service, said he had known Peralta for nearly 20 years, and that the senator was driven to help people. Jordan added that Peralta had a “magnificent smile” that was able to put anyone around him at ease. Toward the end of the service, Matthew played the cello as a touching tribute to his father. Peralta had represented Jackson Heights and surrounding areas in Albany since 2003, but was on track to leave office at the end of the year after losing the Democratic primary in September to State Senator-elect Jessica Ramos. The late-politician’s defeat came after his decision to join the Independent Democratic Conference, a group of eight Democrats who caucused with the Republicans in the State Senate in 2017. The move was widely regarded to have cost Peralta his re-election bid, as he was widely criticized by both constituents and other politicians along the party line, with the decision brought up countless times during Ramos’ campaign. Officials and other guests in attendance, however, put differences aside this morning to pay their respects to Peralta. “There’s a lot of politics, but at the end of the day our families and friendships transcend that,” Katz told reporters. Peralta’s staff members were also mourning his loss. Jacqueline Sung, who worked for Peralta on his November 2002 Assembly campaign, expressed her grief for the family and the community’s loss. May he RIP. And shame on those who blame Ramos for Peralta’s death. How stupid can you be. I agree Ramos didn’t kill him it was sepsis and organ failure. You are pretty misinformed. Her campaign rarely went negative. This is a sudden and sad situation. It has nothing to do with her. We have no way to predict what will happen in life. Keep an open mind and wish her well. I agree with you in the sense that his death is not Ramos’ fault, however, not true that her campaign rarely went negative. She based her campaign on lies to gain votes. Paz en su tumba,acompañándolos de todo corazón,un fuerte abrazo.